CalChamber’s laminated 27.5” x 38” English poster and 27.5” x 35.5” Spanish poster each combines the multiple pages of Wage Order 10 into one convenient poster. These posters are recyclable. Wage Order 10 regulates wages, hours and working conditions in the Amusement and Recreation industry. 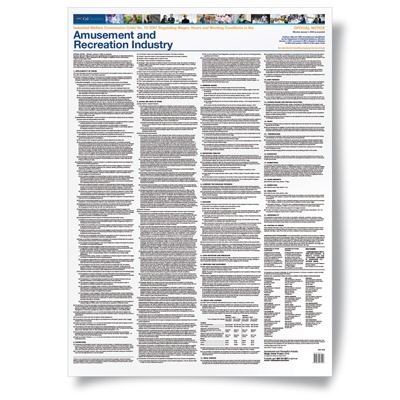 “Amusement and recreation industry” means any industry, business or establishment operated for the purpose of furnishing entertainment or recreation to the public, including amusement parks, athletic fields, theaters, dance halls, bowling alleys, billiard parlors, skating rinks, riding academies, race tracks, swimming pools, gymnasiums, golf courses, tennis courts, carnivals and wired music studios.